Mellow Monk proudly introduces a new tea — Artisan's Reserve. Artisan's Reserve is an artisinal blend of select kabusecha (shade-grown tea) and sun-grown tamaryokucha-style sencha. 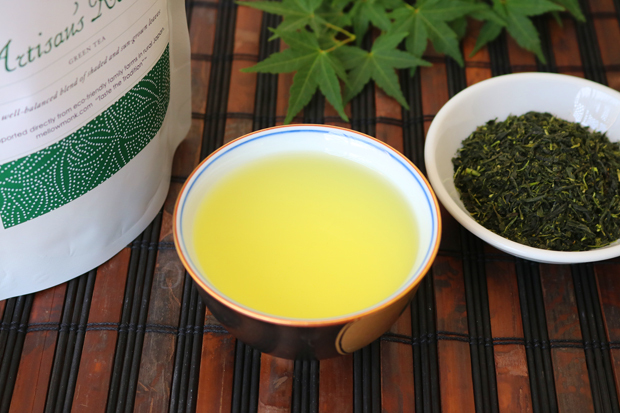 This combination produces an exquisite ensemble of tastes: a subtle herbaceous sweetness with citrus and melon highlights, all over a kabusecha-like creamy texture. Please join us in welcoming Artisan's Blend to the Mellow Monk family. The Kumamoto-based artisan who makes it puts all his tea-crafting heart into this tea, and it really shows.